The 96 year old inventor of the Heimlich maneuver, Dr. Henry Heimlich, died Sat., Dec. 17. Well-known for his determination to develop an emergency procedure that could save people from choking, his method became famous and was implemented around the world. Below you can learn more about the importance of abdominal thrusts (Heimlich maneuver). Make a fist with one hand. Position it slightly above the person's navel. Perform a total of 5 abdominal thrusts, if needed. If the blockage still isn't dislodged, repeat the five-and-five cycle. If you're the only rescuer, perform back blows and abdominal thrusts before calling 911 or your local emergency number for help. If another person is available, have that person call for help while you perform first aid. The American Heart Association doesn't teach the back blow technique, only the abdominal thrust procedures. It's OK not to use back blows, if you haven't learned the technique. Both approaches are acceptable. First, if you're alone and choking, call 911 or your local emergency number immediately. Then, although you'll be unable to effectively deliver back blows to yourself, you can still perform abdominal thrusts to dislodge the item. Grasp your fist with the other hand and bend over a hard surface — a countertop or chair will do. Lower the person on his or her back onto the floor. Clear the airway. If a blockage is visible at the back of the throat or high in the throat, reach a finger into the mouth and sweep out the cause of the blockage. 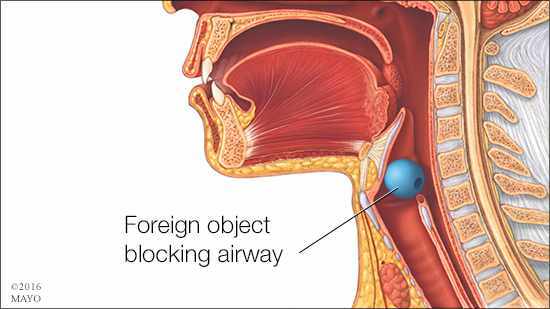 Be careful not to push the food or object deeper into the airway, which can happen easily in young children. Begin cardiopulmonary resuscitation (CPR) if the object remains lodged and the person doesn't respond after you take the above measures. The chest compressions used in CPR may dislodge the object. Remember to recheck the mouth periodically. Assume a seated position and hold the infant facedown on your forearm, which is resting on your thigh. Thump the infant gently but firmly five times on the middle of the back using the heel of your hand. The combination of gravity and the back blows should release the blocking object. Hold the infant faceup on your forearm with the head lower than the trunk if the above doesn't work. Using two fingers placed at the center of the infant's breastbone, give five quick chest compressions. Repeat the back blows and chest thrusts if breathing doesn't resume. Call for emergency medical help. 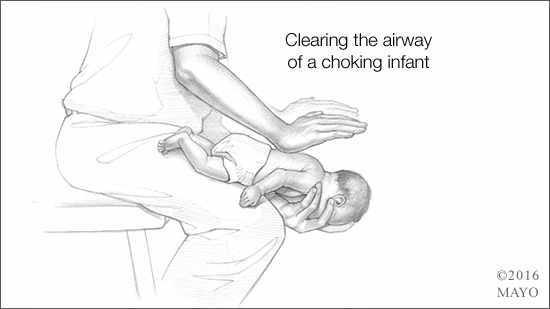 Begin infant CPR if one of these techniques opens the airway but the infant doesn't resume breathing.